The best guerilla marketing campaigns according to Rogue. The best guerilla marketing campaigns. Kitkat and the take a break benches. The best guerilla marketing campaigns. KitKat. It’s one of those “why didn’t I think of that” ideas. Simple and memorable, that’s the perfect combination for a guerilla marketing campaign. Frontline and the flea infested dog. Paddy Power and Bendtners pants. The best guerilla marketing campaigns. Paddy Power. We had to mention Paddy Power here somewhere. We decided to go with the time they paid football superstar and all round great guy, Nicklas Bendtner to wear Paddy Power labeled pants. Which he revealed after he scored a goal. Mr Clean and the zebra crossing. The best guerilla marketing campaign. Mr. Clean. The second of three smaller scale guerilla marketing campaigns. Mr. Clean appeared on a rather dirty zebra crossing, only the white stripe he appeared on was sparkling clean! Bavaria and the orange girls. The best guerilla marketing campaigns. Bavaria. The world cup is one of the most sponsored events in the world. Bavaria thought of a way to get free media attention. This media attention came through a group of women singing and dancing, while dressed in bright orange colours (the brand’s colour). The women were even threatened with jail time! 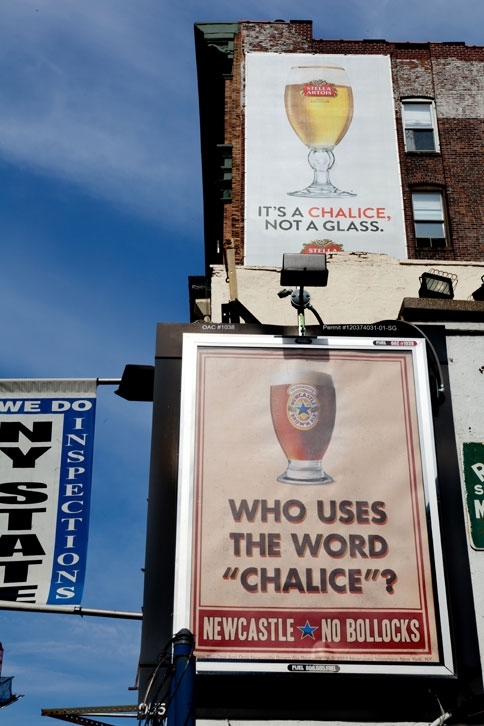 Newcastle Brown Ale and the Word Chalice. The best guerilla marketing campaigns. Newcastle. Placing their poster under a typical Stella Artois print. Newcastle use an amazing bit of humour in an unforgettable bit of ambush marketing. Nikon and the flashing cameras. The best guerilla marketing campaigns. Nikon. We like this one because it would make us feel like celebrities. That’s it. The idea is smart and actually offers an experience to the people partake. Folgers Coffee and the manholes. The best guerilla marketing campaigns. Folgers. The smallest scale guerilla marketing campaign on our list but still one of the best! Extremely memorable and it was seen by a lot of New Yorkers. The Blair Witch Project and the Missing Posters. The best guerilla marketing campaigns. The Blaire Witch Project. Finally, say what you will about the movie itself. The marketing around the campaign was brilliant. The film cost only $60,000 to make and brought in around $248 million. That’s pretty much down to the marketing because let’s face it, the movie wasn’t that great. You think something else should be included in our scientific list of the best guerilla marketing campaigns? Leave some suggestions and we’ll have a look!